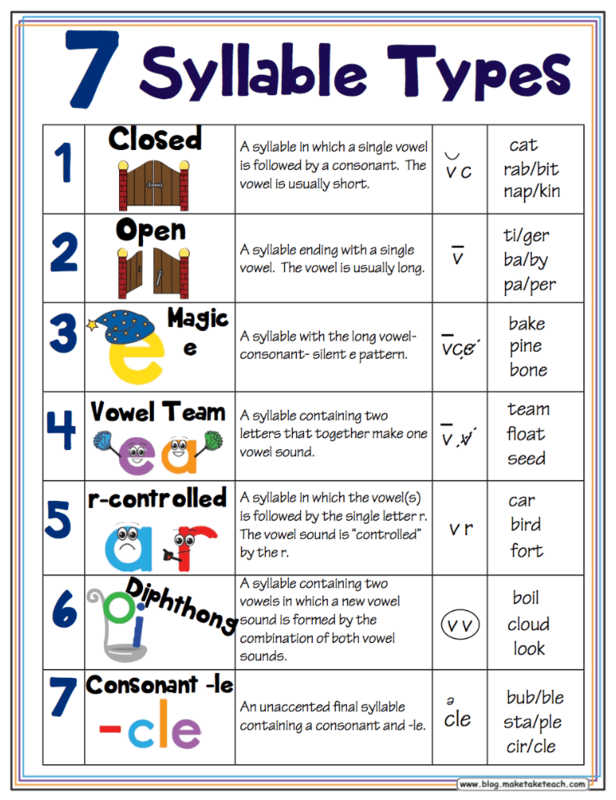 Syllables are simple, one for every vowel sound, so there are lots of syllables around. You can clap or tap, or feel your mouth drop! Hearing syllables is a part of phonemic awareness that can be practiced with a syllable sort mat and animal flashcards. Note that Silent e and Vowel Teams are more powerful. For example, the words cake and team both have the long sound. WATCH this video from Jessie Ketchum. Bossy R & Diphthongs also follow their own guidelines, so car is not short, but makes a new sound, and so does bound. Examples of words with open and closed syllables at sightwordgames. After learning about how to divide syllables, notice that two syllable words with one middle consonant can divide after the first vowel. This leaves the first syllable open, which often has the long vowel sound. Examples: pa|per, be|gin, ti|ger, ro|bot, mu|sic. Note that there are exceptions: about 40% of the time the word splits after the middle consonant, making the first syllable closed and short. Examples: cam|el, ped|al, vis|it, rob|in. Learn more at More Ways That Vowels Can Be Long. We’ve learned about: Silent e, Bossy R, Vowel Teams, Diphthongs, and Open & Closed Syllables. Learning the different syllable types helps makes sense of the different vowel sounds in the English language. The final syllable type to learn about is Consonant -le. At Teachers Pay Teachers: Turtle Trouble Game & Nice Dice practice for the Consonant -le pattern.